This is kind of a lulled week in July: the mighty month of great releases. I caught 21 Jump Street (so funny) and London Boulevard (I've already forgotten it) last night, along with a rewatch of Batman Begins. 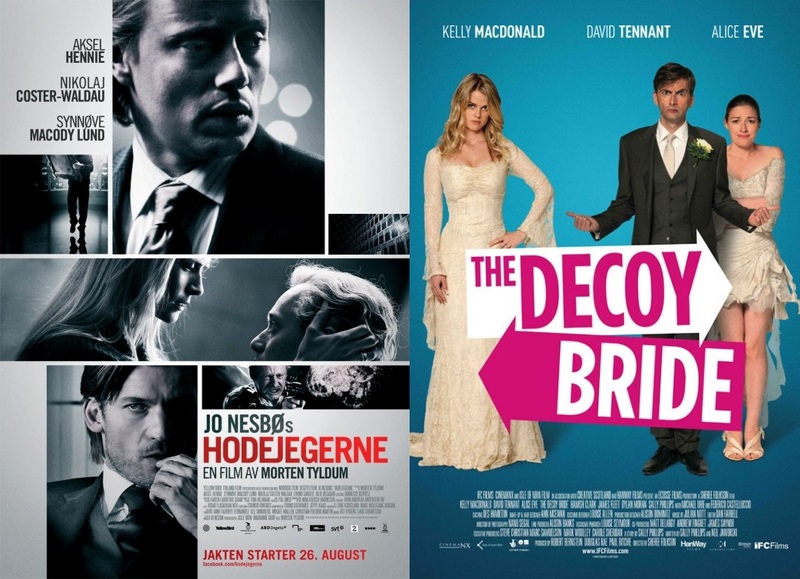 Tonight I'll be checking out smaller titles Headhunters and The Decoy Bride (Kelly Macdonald!). School may be back in business, but all I'm worried about at the moment is The Dark Knight Rises. Two more sleeps!!!!!! I feel like The Perks of Being a Wallflower trailer kinda went unnoticed, especially because I can't remember when it was released. Anyway, I'm excited to see it because of Ezra Miller, who I'm kinda crushing on after We Need to Talk About Kevin even though he scared the crap out of me. I love being a teenager. Tyler shares his favourite closing shots in films. A list idea I'd like to have a crack at in the future. Mette writes a perfect post about her confuzzledness over movie-watching and blogging. This is basically the story of my life. Anyone else a fan of An Education here? Steven has a great review of that wonderful film. Nikhat updates us on her animation month marathon, with the brilliantly sad Grave of the Fireflies in the mix. Andy has a review of the ever elusive Margaret, which I want to see based on the interesting comments coming out of it. Have you been checking out the LAMB's review tourney? I thought I'd be able to pick the writers out from under their pseudonyms, but I'm stumped! Lesya has two blogathons for us: one focusing on silent films and the other calling for recommendations on New York-centered films. Go join! Jessica's blog The Velvet Café has just turned one. Go wish her a happy birthday! What's your favourite experience in cinemas ever? Headhunters looks good, must try and check that one out. My favourite viewing experience in a cinema ever is easily seeing Lawrence of Arabia on the big screen last year. Phenomenal film that's ten times better on the big screen than I ever could've imagined. You'll probably like Headhunters, it was pretty good. I wish I actually went to those David Lean screenings. I've always wanted to see Lawrence of Arabia! Thanks for the link Stevee. Loved HEADHUNTERS! It was pretty cool, wasn't it? Love the list of closing shots you linked to. Favorite experience in cinema? Definitely a stupid, fanboy, personal one. I went to see Enemy of the State on opening weekend with my wife. Not because I had a Will Smith hankering, but because The Phantom Menace trailer was to debut in front of it at certain theaters. I called theaters and found one showing it that was some distance away. I went and... no trailer. Afterward I complained to a manager.He apologized, brought us up to the projection room (which I'd never seen), and cracked open the reel with the trailer. I went back down, sat in a theater that was empty except for my wife and got to experience a trailer few had seen on the big screen at that point. Haha, that's an awesome story! I talked about the Perks trailer in my blog. I think it's really good, and Lerman is adorbs, and really excited to see what Miller and Watson do. Favourite movie experience is probably The Social Network. So much joys. I loved my screening of The Social Network too! Thanks so much Stevee! Your question actually correates to a post I'm going to publish soon, funny stuff. But yeah, tough question. Ever? I'm not sure. Recently, it was Shame. I sat dumbfounded and kept thinking over and over that, "Wow, someone else gets it." The editing of that downfall scene had as much of an impact on me as anything I've ever seen on film. I wish I could have seen Shame in cinemas! That would have been awesome. Thanks for plugging the tourney! As of today, we're finally at the halfway point!... of round 1. Haha, it's going to take a little while, isn't it? I had no interest in seeing The Perks of Being a Wallflower until I found out Ezra Miller was in it. God, that kid was fantastic in We Need to Talk About Kevin. I agree about the SYTYCR tournement, I thought I'd be able to single out a few as well. Nope..not even close. If I guess at least one person right I will consider it a success. Yeah, same. Miller is awesome. I think he'll go far in his career. It is really hard, isn't it? Hereäs a belated thank you for the link love! A nice thing to come home to. I really appreciate it! Belated thank you for the plugs! Favorite experience in cinemas... Third viewing of Inception and second one of The Dark Knight Rises. Mainly because I went there alone and I loves seeing those on my own.